christineiscooking.com: Crock Pot Barbeque Chicken & Ribs (Crock Pot) Easy! 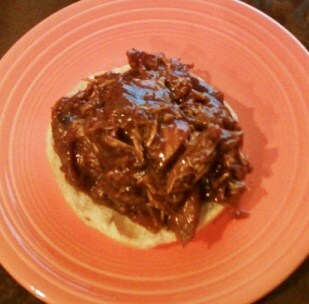 Crock Pot Barbeque Chicken & Ribs (Crock Pot) Easy! Here is how I make ribs and perfect pulled BBQ chicken (all at the same time)! Cooking the ribs with the chicken gives great flavor to it. This recipe is fast, easy and delicious! No one will ever guess how little time it took to prepare. In a crock pot, place your chicken and ribs. Add your sliced onion and BBQ Sauce. When using a sweet BBQ sauce, I generally add mustard and A-1 to cut the sugar a bit and add some variety of flavor. Let cook at least 5 hours on high or 8-10 hours on low. After cooking, remove the ribs (your done with them now). Remove the chicken and shred it. Place the shredded chicken in a sauce pot on your stove along with all the liquid from the crock pot and let the shredded chicken and sauce boil down (be careful it doesn't burn) until the sauce thickens to your liking. Serve on toasted buns with or without coleslaw. *The ribs will be delicious as is, but if you want to go that extra flavorful step (as long as the ribs aren't completely falling apart) apply BBQ sauce to the ribs and then quickly sear them on a hot barbecue grill - a few minutes per side. This isn't necessary for cooking, but just to give the ribs additional flavor. WOW! I can see how this would be a awesome meal..... never thought of cooking them together! Can't wait to try this.